Squash half right out of the oven. 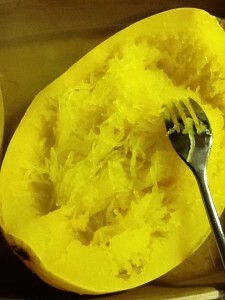 Fall harvest brings us a multitude of winter squashes, but one of my favorites is spaghetti squash. A lot of people shy away from this one because they don’t know what to do with it. I’ve always taken its name pretty literally and treat it just like I do spaghetti. And just so you know, my kids enjoy it, too, and did even when they were little. Jab fork into flesh and pull up as if stirring to get strands. 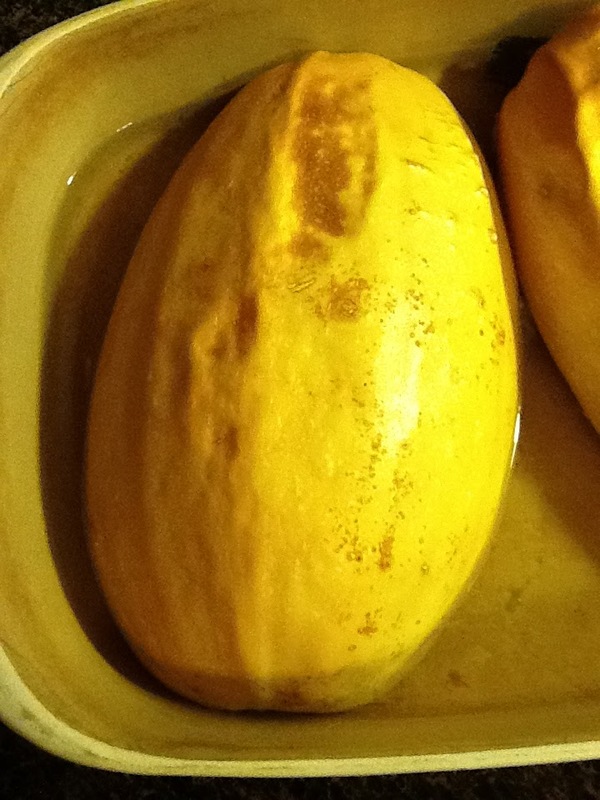 Cut it in half lengthwise and scoop out the seeds. Fill a baking dish with about 1/2″ of water. Put squash halves cut side down. Bake in 400 degree oven for about 40 minutes or until tender. Using a fork, shred the squash into strands. Now you can do all kinds of fun things with it! For a basic side dish, simply add butter, salt and pepper. Like it sweet? Add butter and brown sugar. Feeling adventurous? Try this interesting taco recipe. My go-to choice – top with my favorite sauce (red or white, meat or meatless), add a side vegetable and serve with garlic bread. The photo below shows the squash with red sauce and Italian sausage, topped with fresh Mozzarella and green beans on the side. Yum! Spaghetti squash doesn’t have to be weird and scary. It’s versatile, delicious and ideal for a low-carb diet or a vegetarian night. Give it a try. I dare you! 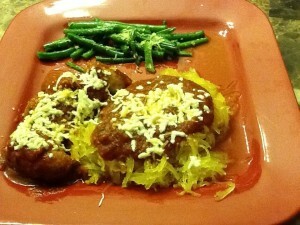 Have you ever made spaghetti squash? What’s your favorite recipe? Hi Kristie! We love spaghetti squash in our house too. I leave it in the oven until the peel is golden brown, it brings out a hint of sweetness from the caramelization of the squash. Sautee with some olive oil and garlic. Sprinkle some fresh parmesan cheese and it feels like I’m having carbs. Can’t beat that!